Is it Gen 3 or a trial balloon? I’ve been scouting for a Cool Earth Solar inflated solar concentrator ever since I found the 7900 Tesla Road CONDITIONAL USE PERMIT, C-8724, application below GreenVolts GV1 in an agenda for the Alameda County Community Development Agency. 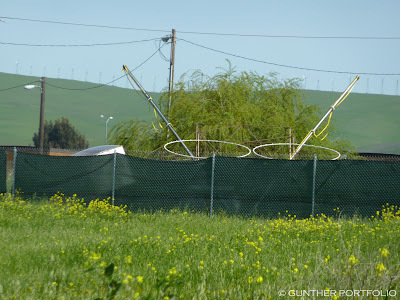 Every time I’ve scouted GreenVolts GV1, I have also reconnoitered the Cool Earth Solar (CES) headquarters and proposed Tesla Road site in Livermore, California USA. Because of the year end holidays and subsequent California El Niño storms, I just had my first chance to scout for Gen 3 since posting Cool Earth Solar at the 22nd NREL Industry Growth Forum. 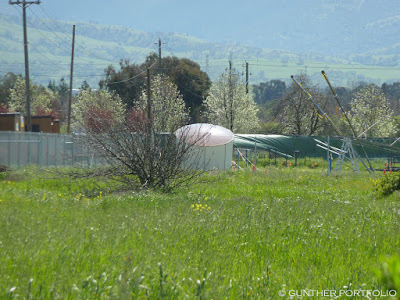 The above photo appears to be a third generation, Gen 3, CES Concentrator PhotoVoltaics (CPV) balloon located in a test site just across the street from their headquarters. I’ll have to engage in speculation because Cool Earth Solar has not acknowledged or responded to my questions regarding the apparent test inflated solar concentrator. The test system was pointed towards the sun though I did not observe the balloon long enough to determine if it was indeed tracking or even functional. I suspect the white skirt around the balloon is in place to hide a tracker, water hoses, air hoses, and perhaps, just a wild guess, an inverter. A cross is visible upon the balloon top. Has the receiver strut been replaced by two crossbars or are these reinforcing cables or hoses? I could not tell if the receiver was in place or not. In the second side photo obscured by a fence along Bennett Drive, the transparent top film of the balloon is distinct. Considering both photos, the V-shaped poles are connected to a lattice tower with two circular balloon mounts in contrast to the cable rigging method seen before in a company supplied photo. Sources I cannot confirm continue to believe the CES receiver design is in flux and the optic design has not been finalized. In fact, receiver and optic Technology Challenges dominate the “Reliability considerations for a 7kW incident CPV monolithic concentrator module” Poster Session presented by CES Principal Scientist Leo Baldwin at the recent U.S. Department of Energy (DOE) Solar Energy Technologies Program, Photovoltaic Module Reliability Workshop. I believe the points made in “Solar Startups in Stealth: Solexant, Solexel, Stion…” by Eric Wesoff for Greentech Media have inflated relevance for Cool Earth Solar. Is a trial balloon all Cool Earth Solar has accomplished since being founded in 2006 and landing $21 million Series A funding in early 2008? I find the plans disclosed by Cool Earth Solar CEO Rob Lamkin at the NREL Forum for the construction of a 1 MW (MegaWatt) pilot power plant in 2010 to be rather unbelievable. That or a gamble of Las Vegas proportions. If CES has field test site(s) in operation generating kiloWatt-hours of electricity and logging real world performance data, I applaud their stealthiness. However, I don’t have any reason to believe this is true. CES has missed every deployment milestone including those mentioned in “COOL EARTH SOLAR’S SOLUTION: BIG PARTY BALLOONS” by Matt Nauman for the San Jose Mercury News. Archived at CES, the article is no longer available at siliconvalley.com, and Mr. Nauman never bothered with a follow up. If anything, Cool Earth Solar has done a better job with Public Relations (PR) than development and deployment as the Schwartz Communications CES Case Study illustrates. How else could Cool Earth Solar have become an INNOVATION in RENEWABLE ENERGY category finalist in the RenewableEnergyWorld.com 2009 Excellence in Renewable Energy Awards? I assert that not a single journalist or blogger has ever seen, verified, or photographed a Cool Earth Solar inflated solar concentrator in operation delivering electricity. Let the spin control begin. GP Update: The Cool Earth Solar Trail Balloon video is now available on YouTube. Thanks for chasing the story. Cool earth like many green companies main goal has little to do with improving the earth and more with cash. Keep track of Cool Earth it needs to have someone hold it accountable for acting like it cares about the earth. They managed to subvert 21 million for phony technology. The reality of power generation is that it not easy and needs true engineering to bring it to the market not a bunch of PhDs sitting around thinking wouldn’t it be cool if we could get paid to create nothing. If the idea is good they have the money to hire true engineers but I am afraid the last thing they want on their staff is a true power generation engineer to inform them you can not scale up a idea that requires a thousand balloons to generate a single megawatt.